SPEEDbit (http://www.speedbit.com/), a 2008 World Economic Forum Technology Pioneer, announced today the 20th million installation of SPEEDbit Video Accelerator, the application that makes web videos from YouTube and many other video sites play smoothly without annoying buffering stops. Dave Kaminski's (Web Video University) independent and unsolicited review of the product reveals how playing an HD video in the US over a very fast 20 mbps Internet connection resulted in 25 buffering stops, while watching the same video with Speedbit Video Accelerator installed eliminated those 25 buffering stops to just 1 split second stop. The video of the review has been viewed about 230,000 times and can be watched here: http://www.youtube.com/watch?v=xfh3qvaQdgM. "We are thrilled by the enthusiastic response to SPEEDbit Video Accelerator, and by its rapid organic growth and adoption from users seeking a smooth web video experience," said Idan Feigenbaum, SPEEDbit's Founder and CTO. Ariel Yarnitsky, SPEEDbit's CEO, said "the HD revolution is happening now. Everyone, no matter where they are should be able to enjoy smooth playing HD videos and we are here to make this a reality." Founded in 1999, SPEEDbit is the leader in download acceleration technology with over 180,000,000 installs of its products to date. SPEEDbit's patented technology maximizes bandwidth utilization and efficiency to ensure content downloading and streaming is delivered to the user in the fastest and most efficient manner. See full list of supported video sites. SPEEDbit Video Accelerator makes videos from YouTube and over 165 sites stream faster and play smoother, by reducing buffering problems and video interruptions or "hiccups". The unique video search feature lets you find the latest and hottest videos around the web and the "Recently Accelerated" " list gives you instant access to the last videos played. SPEEDbit Video Accelerator for iTunes is the first Video Accelerator Premium version that accelerates the download of all iTunes movies, music videos and TV shows up to 10 times faster. SPEEDbit Video Accelerator (www.videoaccelerator.com) is a pioneering product of unique technology that improves the viewing experience of streaming videos from YouTube and over 165 sites by eliminating buffering problems. SPEEDbit are continuously developing its technology and in the near future, will be able to accelerate even more video downloads from different content providers. Delivering rich media to end user's machines is turning out to be a major challenge for even the biggest media companies. High quality videos (and many times even low quality videos) tend to freeze when streamed to end users, giving a somewhat poor viewing experience. Movies and TV series tend to sometimes take several long hours to download (see Bambi Francisco's article on MarketWatch - Why Wal-Mart's Movie Service is in Beta). These performance barriers slow down the adoption of the online rich media delivery platforms, in their quest to make content easily and readily available to consumers without the need to buy/rent/ship a physical CD or DVD. SPEEDbit Video Accelerator supports videos from YouTube and over 165 sites and leverages unique and patent pending multi-connection technology to accelerate the caching of streaming videos, thus helping overcome annoying buffering problems. This product works under the hood keeping the user interface of the respective service in tact. For example when watching a MySpace video, the MySpace interface will simply show multiple leaps a head of the video caching bar, resulting in much faster completion of the caching/downloading of the streaming video. Whenever a YouTube or other video (see full list of supported video sites) is being accelerated, a small message will show on the right bottom side of the screen indicating to the user that the acceleration is active. 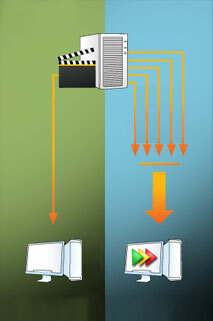 The main screen of the product also allows a user to make video searches straight from the desktop application – the video search is based on videos on various video sites such as www.youtube.com, www.metacafe.com etc. more sites are added every day. Although SPEEDbit Video Accelerator supports videos from YouTube and over 165 sites,the team is already working hard on adapting the product to support even more video streaming and download acceleration. The team has released SPEEDbit Video Accelerator for iTunes and is already working on supporting more proprietary rich media download services similar to iTunes (Premium) such as Amazon's UnBox and Wal-Mart's video download service etc. SPEEDbit Video Accelerator comes from SPEEDbit (www.speedbit.com), the creators of Download Accelerator Plus (the popular download manager with over 147 million registered users and more than 50k of new users joining everyday). SPEEDbit is backed by Pitango venture capital and Yossi Vardi, the founding investor of ICQ - the pioneering instant messenger that was sold to AOL in 1998, and managed by Ariel Yarnitsky the former general manager of ICQ. "By using this app, you spend more time watching video & less time waiting to watch video." Deutsche Telekom paying special attention to Speedbit. Video Accelerator's advanced technology uses multiple-simultaneous download sources ensuring that streaming videos play without freezing, HD videos stream significantly faster, and iTunes content downloads extremely fast.